In late December 2008, while on the East Coast for Eli’s great grandmother’s 90th birthday, Eli started vomiting and became very lethargic. As people in NYC rang in the New Year of 2009, Eli had a massive 90-minute seizure. He was rushed to a PICU at another hospital where he had CT scan revealing a non-malignant brain tumor known as a Craniopharyngioma. The tumor was so large, it obstructed the flow of cerebrospinal fluid causing Eli to vomit and have headaches. He was rushed to the OR for a shunt placement to drain the CSF and save his life. 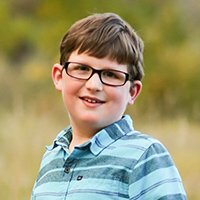 Thanks to the research funded by The Morgan Adams Foundation, Eli’s tumor is now the first craniopharyngioma brain tumor in the world to be Gene Micro Arrayed. This work was continued by Eli’s dad, a post-doctoral fellow at the University of Colorado Cancer Center, and funded by MAF. Thanks to their generous funding, Eli’s dad continues to learn more about this elusive tumor to find better treatments to help decrease the terrible side effects of this tumor so children like his son can have a better and brighter future. Eli is a big brother and enjoys going to school. MAF Impact: Eli inspired us to look at the chip data for all children with craniopharyngiomas, something which had never been done in any center. This has suggested potential new therapies for this tumor.